On An Overgrown Path: Online retailer maxed out? But where is MaxOpus today? The composer's pioneering online venture has been returning an 'Internet Explorer cannot display the webpage' message for some time now, although his publisher still links to it. Temporary technical gremlins, too much too soon or just a victim of Max's problems with his business manager? Information and updates, as ever, welcomed. 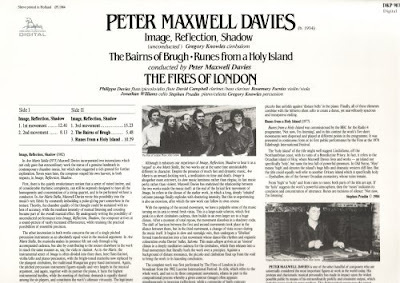 Now playing - Peter Maxwell Davies' Image, Reflections, Shadow played by The Fires of London with Gregory Knowles cimbalon (visible bottom right in the header image) on the original 1984 LP release from the now defunct independent Unicorn-Kanchana label, and quite magnificent it still sounds. The header image shows the back of the LP sleeve, I'm glad I hung on to the vinyl. I notice that Misha Donat produced the Unicorn recording. He was also producer of the label's wonderful cycle of Elizabeth Maconchy String Quartets, which is a perfect back-link. In fact, MaxOpus disappeared due to Max's difficulty with Judy Arnold, his manager at the time, and her husband. There seemed to have been some question about who actually owned it. Word has it that the situation has been settled, it can be hoped, will result in MaxOpus being back on line before long. A whois search on the domain name lists Mr Arnold as the registrant. The technical contact has an e-mail address at a prominent UK university. I hope it all gets sorted out soon.